Situated in the province of Carrillo, Belén is a traditional Tico town with lots of warmth and exponential potential. Complete with all of the modern amenities, the local small-town feel and friendly population will make residents not want to leave. Only 40 minutes away from Guanacaste’s most famous beach town of Tamarindo, investors and families love Belén for its convenience and its proximity to both commerce and entertainment. The center of Belén is relatively small, but it offers all of the services that residents want, including supermarkets, a hardware store, a gas station, restaurants, bars, ice cream shops, and internet cafes. This beautiful town is home to many working families as well as professionals who enjoy the serenity of Belén’s rolling plains. Belén’s proximity to beaches, shopping centers, and adventure activities make it a prime residential and business opportunity. People considering investing in Costa Rica or relocating to the area should definitely investigate Belén for its local prospects. Belén’s location on the major highway between Tamarindo and Liberia makes it a busy location with a constant stream of tourists running through it. 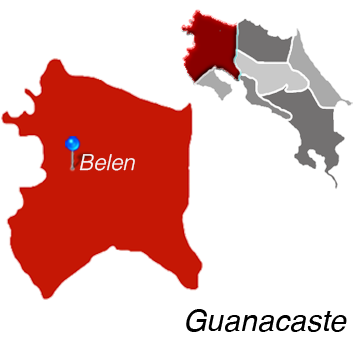 As a result, businesses enjoy Belén and its steady supply of customers. Those investing in Costa Rica will find villas, condos, and single-family homes in Belén. The area is mostly geared towards working and middle class families, but luxury homes can also be found nearby. Lots are usually flat although a few hills on the local roads right outside of town can provide ocean views. Local residential developments are popping up in and around the town, and there are many lots available for development. Families can enjoy having all the necessary amenities close by as well as the beaches for making the most out of free time. Professionals will also enjoy the town’s laid-back feel with proximity to Tamarindo, Liberia, and the international airport. Belen is Located in Guanacaste.